La Prensa Medica Argentina (LPMA), brings articles in all areas related to medicine on bimonthly basis. LPMA welcomes the submission of manuscripts that meet the general criteria of significance and scientific excellence. Papers will be published approximately 15 days after acceptance. Publishing under Open Access mode involves a publication fee of US $ 1219. 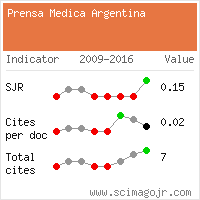 Confirm that each individual named as an author meets the uniform requirements of the La Prensa Medica Argentina criteria for authorship. The information must be based on original research that adds to the body of knowledge in La Prensa Medica. Case studies are accepted with a view to add additional information related to the investigative research that advances in the field of medicine. Editorials are concise commentaries on a currently published article/issue related to medicine. Editorial office may approach for any such works and authors must submit it within three weeks from the date of receiving invitation. Clinical Images are nothing but photographic depictions of topics related to medicine and it should not exceed more than 5 figures with a description, not exceeding 300 words. Generally no references and citations are required here. If necessary, only three references can be allowed.